Yellowstone National Park Lodging varies quite a bit depending on your taste for wilderness lodging, your vacation budget constraints and also, you sense of adventure for the outdoors. If you are planning a vacation to Yellowstone then you have a whole host of options inside and outside the park. If you want to stay directly in Yellowstone there are several accommodations to suit your needs. The are 9 different lodging and resort areas inside Yellowstone National Park. Those include Canyon Lodge and Cabins, Grant village, Lake Lodge Cabins, Lake Yellowstone Hotel and Cabins, Mammoth Hot Springs Hotel & Cabins, Old Faithful Inn, Old Faithful Lodge Cabins, Old Faithful Snow Lodge & Cabins and Roosevelt Lodge & Cabins. If you are out for a sense of adventure then Old Faithful Inn is for you. The Inn will transport you back in time to the early part of last century. Old Faithful Inn is a national historic landmark and one of the largest log structures in the world. The Inn has several rooms directly overlooking Old Faithful, the most famous geyser in the world. The main building for the Inn known as the "Old House" was started in 1904 and is immense in size. The lobby soars to 78 feet overhead and is a literal forest of timbers as you gaze towards the ceiling. Most rooms at the Inn are not like your typical hotel rooms and for families there are even two room units available. Prices for lodging range from $404 per night for a large suite to $85 per night for a room without a bath. Midrange rooms are priced at $111 per night. Old Faithful Inn is a rustic experience that you will not soon forget! If you're not quite as adventurous and would like less rustic and a bit more modern accommodations then you might want to consider Mammoth Hot Springs Hotel. The hotel has rooms inside the main building and several cabins located around the property. Mammoth Hot Springs Hotel is located just below Mammoth Hot Springs and is within walking distance of the springs. The springs are located in the northern most part of the park. One bit of news about Yellowstone accommodations, to preserve the natural beauty and rustic history of the park all Yellowstone National Park lodging does not offer televisions, radios, air conditioning, or Internet hook-ups, so plan to really get away from it all when you come to Yellowstone. 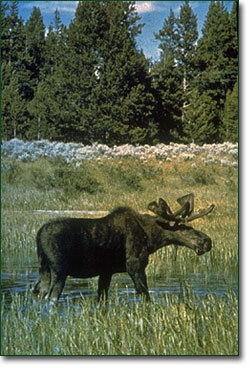 Enjoy your vacation, outdoor activities and trip to Yellowstone National Park.